American consumers are more conscious than ever of their energy consumption. Rising energy costs combined with an increasing awareness of the impact of nonrenewable fossil fuels on the planet is leading American homeowners to practice proper home maintenance and embrace alternative energies. This grassroots energy revolution could be the moment sustainability advocates have been waiting for, the moment “green” power goes mainstream. For many years, the onus was on energy companies to start delivering clean, green energy to consumers. While solar energy was responsible for 32 percent of total new power generation in 2014, in large parts of the country, alternative energies still account for just a minute fraction of the energy pumped out by power companies. This failure on the part of big energy corporations, whether due to regulatory, political or geographical restrictions, has started to push people to take matters into their own hands. First it was the early adopters who looked for ways to generate their own energy, but thanks to the driving down of costs due to government initiatives and attractive tax breaks, “average” homeowners have been quick to jump on this cost-saving bandwagon. In South Carolina, for example, a state where residential solar panels numbered in just the hundreds a couple of years ago, a consumer-driven legislative agreement to enable third-party solar leasing and allow net metering for at least 10 years has kick-started this energy-conservative state into a solar frenzy. It went into effect in 2015, and that year saw $10 million worth of solar installations, a 183 percent increase over the previous years in just under 18 months. Solar panels started popping up on roofs in traditional neighborhoods as homeowners began to embrace the power of the sun to drive their homes. The neighborhood effect is a proven driver of technology: If the Joneses can afford to do it, why can’t we? If current growth rates continue, by 2025, there should be 90 gigawatts of solar power in the U.S., more than 8 percent of current capacity, according to analysis from UBS. The Solar Investment Tax Credit is a huge driver behind this growth, and its recent extension through 2021 should help stabilize the industry even further. With the adoption of solar power, we can expect to see a much more rapid uptake of other green technologies, especially those consumers can control themselves and from which they can see real-time benefits. Consumers are drawn to installing solar panels for the economical, clean, low-maintenance power that will reduce their monthly power bills and maybe even provide added financial benefits when power companies pay them for excess energy sent back to the grid. Once they get a taste of this energy independence, however, the step toward an electric vehicle is an obvious one. No more trips to the gas station — just install an electric vehicle charging station in your home and watch the sun power it. Of course, the problem of what to do when the sun doesn’t shine has plagued solar sales, but the promise of the whole-home battery, which can store excess energy produced by the panels and feed it back to your home at night or on cloudy days, has already become a reality. Tesla’s Powerwall whole-home battery — a consumer battery that can harness the excess energy your solar panels produce so you can use it whenever you need — is bringing complete grid independence closer to reality for regular homeowners. One of the first consumers to install a Powerwall says the system has cut his electric bill by 90 percent. While the $3,000 price tag is surprisingly low, installation costs can rocket that to close to $10,000, according to Greentech Media. However, the construction of Tesla’s awesome Gigafactory in Nevada promises to slash the prices of its lithium-ion batteries, and others are likely to follow suit. The success of solar has proven that it’s the price point, not a fear of the technology, that is the issue for consumers. While early adopters are often more focused on reduction in waste than reduction in their expenses, for the mass consumer it’s saving money that often appeals. The combination of leased solar panels and an affordable whole-home battery could be the biggest step in the residential energy use revolution. While geothermal and wind turbines are two green technologies that have somewhat stalled — geothermal has been around for decades and wind turbines have many hurdles to cross before they go mainstream, chief among them acceptance and maintenance issues — they could see a similar uptick in adoption very soon. Especially if business and government get behind these technologies at the behest of the consumer, as they have with solar. Geothermal has already benefited from significant tax breaks, and while still a very expensive system to install, its benefits are arguably even more profound than solar because it doesn’t need to deal with the volatility of weather. In Canada, by 2011, nearly 40 percent of heating systems replaced went geothermal. Wind turbines are even more restrictive than solar, being dependent on a more volatile energy source. Despite this, in ideal situations they offer significant energy benefits, including more energy produced for the cost, power generation at night and a smaller installation footprint. When consumers fully embrace the concept of generating their own power, creating “distributed generation” and taking away the dependence on the power companies, it’s not hard to see a future where solar panels, wind farms and battery-powered homes are the mainstream. It’s no longer science fiction, it’s close to becoming a reality. As this reality takes hold, and as American consumers take control of their power use, businesses that care about people, the planet and their profits need to be ready, willing and able to help them get there. About the author: Jennifer Tuohy is constantly trying to figure out how the latest tech developments can help us to live greener lives. 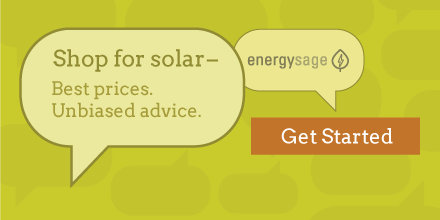 She looks at all the options — from solar panels to wind turbines to geothermal energy — and the latest information to provide great advice and help you make an informed decision. To see more alternative energy options, visit The Home Depot. Jennifer Tuohy is an award-winning journalist, editor and blogger based in Charleston, S.C. Jennifer frequently writes about eco-friendly and sustainable home improvement solutions.